Step 6 – Anti-Stick Provisions Keep the hot plastic from sticking. There are various means to achieve a satisfactory release of the plastic material after sealing. PTFE Cover Strip to cover the Heatseal Band or a PTFE coating on the band itself will provide release if used in conjunction with precise time and temperature control. In spite of the best efforts, chronic sticking may occur if the Heatseal Jaw is opened too early or too late. If opened too soon the plastic material may be gummy and tend to adhere. Too late may be worse because the plastic material has not only cooled to be firm but also hardened and adhered to the microscopic pores of the release coating. If sticking occurs after a prolonged cooling cycle, it can usually be remedied by opening the jaws a few milliseconds sooner while the seal is still warmer and slightly pliable. “PTFE Tape” is primarily used as a covering over Heatseal Bands to prevent the hot plastic material from sticking to the band as well as over the silicone elastomers on the opposing jaw. It is occasionally used as an electrical insulator between the Heatseal Band and the jaw when a minimum thermal insulation is desired. The proper selection of thickness and style is imperative if good consistent seals are to be obtained. After quality, thickness is the most important consideration in selecting a “PTFE Tape” for heatsealing applications. 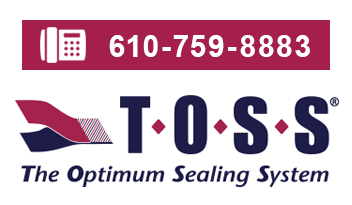 Although the tapes are available in thicknesses of 3 to 10 mil (.003" to .010") the most popular thicknesses for heatseal applications are 3, 5 and 6 mil. Thin material, 3 mil, has the advantage of permitting the heat to flow faster from the Heatseal Band through the tape and into the plastic material to be sealed thus reducing sealing time and permitting higher production rates. The use of thick tapes to cover the Heatseal Band is undesirable because Heatseal Band temperatures must be increased by as much as 35°C to compensate for the insulating affect of the tape. It is true that thin tapes must be replaced more frequently, but when thick tapes are used, the Heatseal Bands must be replaced more frequently because they must be operated at higher temperatures for a prolonged heating cycle to allow for the slower heat flow through the tape during both heating and cooling. A 6 mil, self adhesive tape is appropriate for covering the silicone elastomer that is mounted on the jaw face opposite the Heatseal Band. “PTFE Tape” can be supplied in virtually any width, but standard sizes are more readily available. When determining the width, it is important to allow an adequate width of tape that is not adhesive coated in the zone that comes in contact with the Heatseal Band. Adhesive in contact with the Heatseal Band impedes free movement as the band expands and contracts with temperature change. Adhesive on the tape can cause the Heatseal Band to buckle and distort or cause the tape to wrinkle. Either way, the quality of the heat seal is adversely affected. See Cover Strip (below). For heat sealing applications, standard grade is commonly used; however, Premium grade is available in most configurations. Premium grade (Grade A) is made with a heavier coating of PTFE which produces a smoother surface and better release characteristics at the expense of slightly slower heat transfer. Premium grade 3 mil Cover Strip is the best selection for covering Heatseal Bands. This material is most commonly used to cover special profile bands and platens or irregular shapes where a self adhesive (pressure sensitive) tape cannot be used because of adhesive contact with the Heatseal Band. Provided with about 1.5 mils of adhesive on the back these tapes are used for covering the opposing unheated jaw and for various general purposes such as covering machine surfaces and web formers to reduce friction or to cover silicone elastomers for anti-stick purposes. 3 to 6 mil tapes of premium grade are usually best in these applications. This most popular tape has an adhesive free zone down the center. It is excellent in the 3 mil thickness as an anti-stick cover for Heatseal Bands because it allows free movement when the band is expanding and contracting. Cover strip is premium grade PTFE tape with a specific width of silicone adhesive along the edges. The uncoated zone, the “effective area”, can be as narrow as 10 mm and the adhesive width can be as wide or as narrow as needed. The adhesive has adequate adherence and strips away clean when removed for replacement. This style has found numerous applications where configurations or space limitations demand a tape that is custom designed to fit. The most common size is 3 mil, 35 mm wide with 12 mm adhesive free in the center. Other widths and thicknesses are available on special order. This is a composite tape made up of PTFE cloth tape to which a paper or glass filament adhesive strips have been adhered along the edges. The adhesive strips are covered with a peelable backing strip. Supplied routinely in premium grade of 3, 5 and 6 mil, with adhesive strips extending 12 mm beyond the edges of the PTFE cloth. This KB tape can be supplied slit to the customer specifications. The effective width of KB tape is the distance measured between the inside edges of the adhesive strips, and must be specified when ordering. Available in premium grade of any width greater than 40 mm wide, and any thickness, this tape is PTFE cloth strip to which a 12 mm wide strip of double back adhesive has been adhered along each edge. Excellent for demanding applications where additional holding power is needed or for uneven surfaces where the thicker adhesive layer can conform to the surface. The effective width is always 24 mm less than the full width of the PTFE cloth strip. Surface coatings can be applied directly to the Heatseal Bands as a means of producing an anti-stick surface. PTFE coatings come in a variety of compositions, some with fillers such as Silverstone. Direct coating of Heatseal Bands produces a very effective band with minimal heat loss through the coating, however, the coatings are not hard and the anti-stick quality of the coating may not last very long. Care must be exercised to assure that the band temperature does not exceed the limits of the coating. The upper temperature limit for safe operation with most all PTFE coatings is 250°C as with all PTFE products. Toss Heatseal Jaws and jaw components are readily available to simplify your Heatseal System design and construction. When making heat seals on plastic materials the softened plastic will tend to adhere to the Heatseal Band, Heated Seal Bar, or Platen. This can damage the seal, foul the seal bar, and prevent the material from moving freely through the machine. It is, therefore, necessary to provide a means of assuring the easy release of the material after sealing.